If you are partaking in this holiday's celebrations, you may be at risk for a potential hangover, which can be especially rough with work the next day. I would be lying if I said I haven't been in this situation before, but at least I learned a few lessons from it! The first thing I would recommend is to stay in bed on a comfy mattress, and get as much sleep as you can! There is nothing better for a hangover than rest and relaxation, but sometimes that isn't always possible. If you must get up and get going, a shower, coffee, water, and acetaminophen are necessary to an energy bolt. 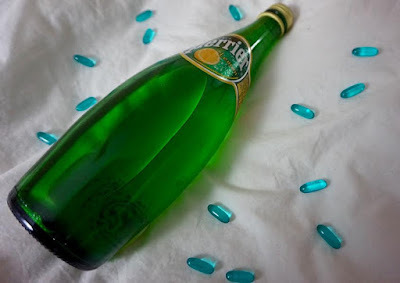 I often crave bubbles and carbonation when hungover, but a way to satisfy that craving and prevent further dehydration is by drinking sparkling water, such as lemon Perrier. After working towards feeling better, it's time to look better. Being hungover can really take a toll on your skin, by being very dehydrating. 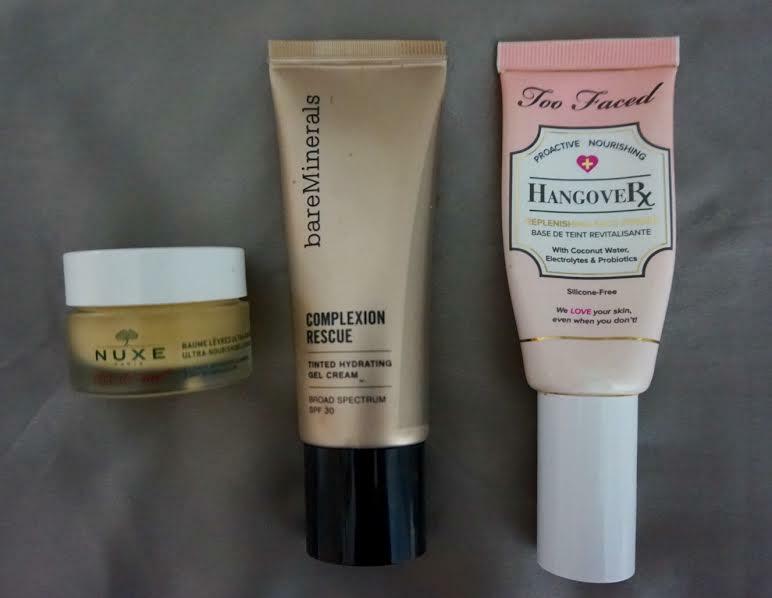 I recommend using a moisturizing primer like the Too Faced Hangover RX before makeup application. 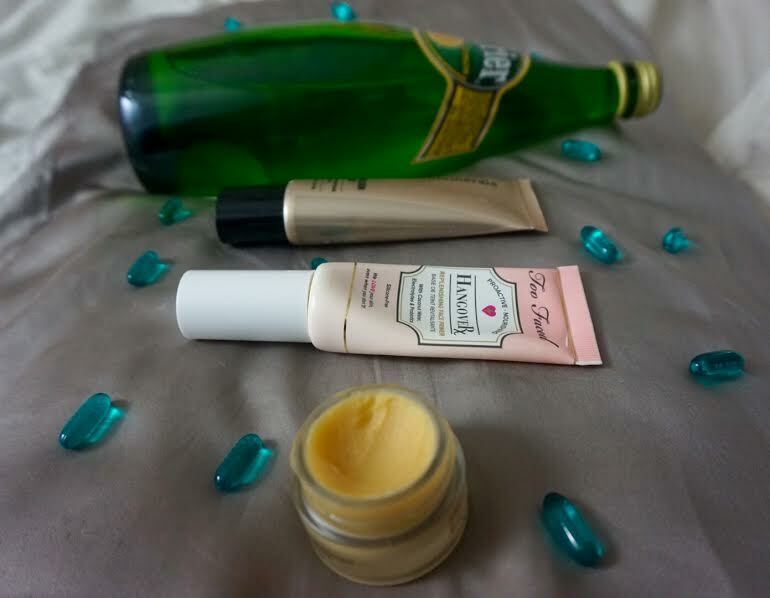 As far as makeup goes, keep it fresh and glowy. You all know I have mad love for the Bare Minerals Complexion Rescue tinted moisturizer to keep skin looking healthy and luminous. Don't forget to care for those lips as well! The Nuxe Reve de Miel lip balm absolutely drenches your lips in hydration without being sticky, shiny or goopy. Throughout the day, if you are able to move around a bit, potentially get some exercise, that will also work wonders! And although the greasy cheeseburger may look like your friend, maybe opt for a somewhat healthier meal, such as a salad with chicken... maybe crispy chicken depending on the hurt-levels happening here. Those are my tips and tricks for fighting that hangover feeling! 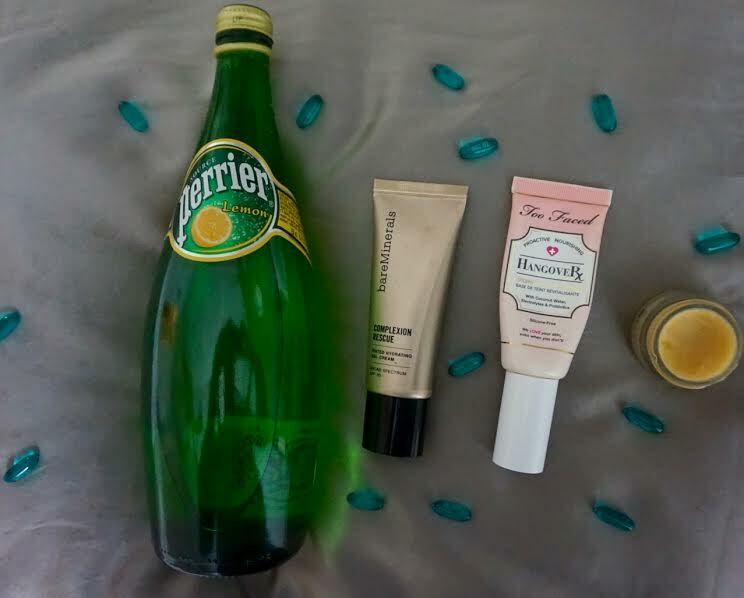 What are you favorite tips for that post-party morning-after? I'll have to look into that moisturizing primer, seems like a great thing to have. Thanks for the tips! Great tips! I like to keep a water bottle next to my bed to stay hydrated!